We explain the 24 British English consonant sounds in short videos (Lessons 6-11) and give examples of spelling and quizzes as part of our English pronunciation sounds course. You can watch, listen and repeat each consonant sound (p b t d) and the examples. Here are spelling examples for each consonant sound (p b t d). Choose the consonant sound (p b t d) that we have underlined in each word. You can watch, listen and repeat each consonant sound (tʃ dʒ k g) and the examples. Here are spelling examples for each consonant sound (tʃ dʒ k g). Choose the consonant sound (tʃ dʒ k g) that we have underlined in each word. You can watch, listen and repeat each consonant sound (f v θ ð) and the examples. Here are spelling examples for each consonant sound (f v θ ð). Choose the consonant sound (f v θ ð) that we have underlined in each word. 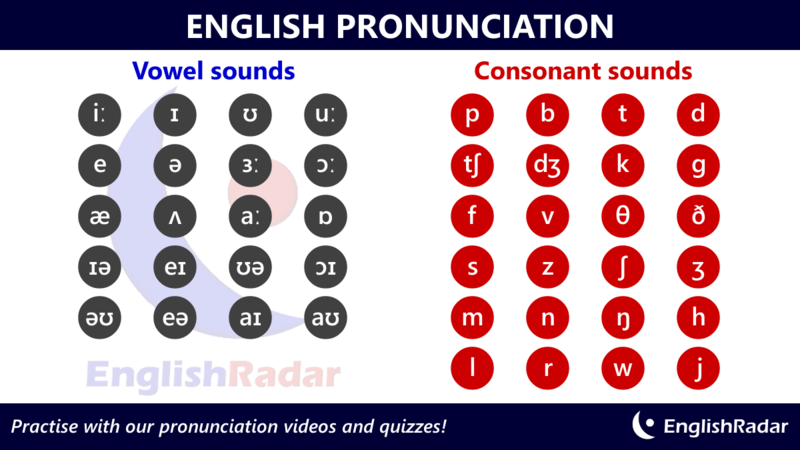 You can watch, listen and repeat each consonant sound (s z ʃ ʒ) and the examples. Here are spelling examples for each consonant sound (s z ʃ ʒ). Choose the consonant sound (s z ʃ ʒ) that we have underlined in each word. You can watch, listen and repeat each consonant sound (m n ŋ h) and the examples. Here are spelling examples for each consonant sound (m n ŋ h). Choose the consonant sound (m n ŋ h) that is underlined in each word. You can watch, listen and repeat each consonant sound (l r w j) and the examples. Here are spelling examples for each consonant sound (l r w j). Choose the consonant sound (l r w j) that is underlined in each word. Just click on the buttons below for our introduction and English vowel sounds videos, or to find out more information about our English courses to develop your English pronunciation and fluency.